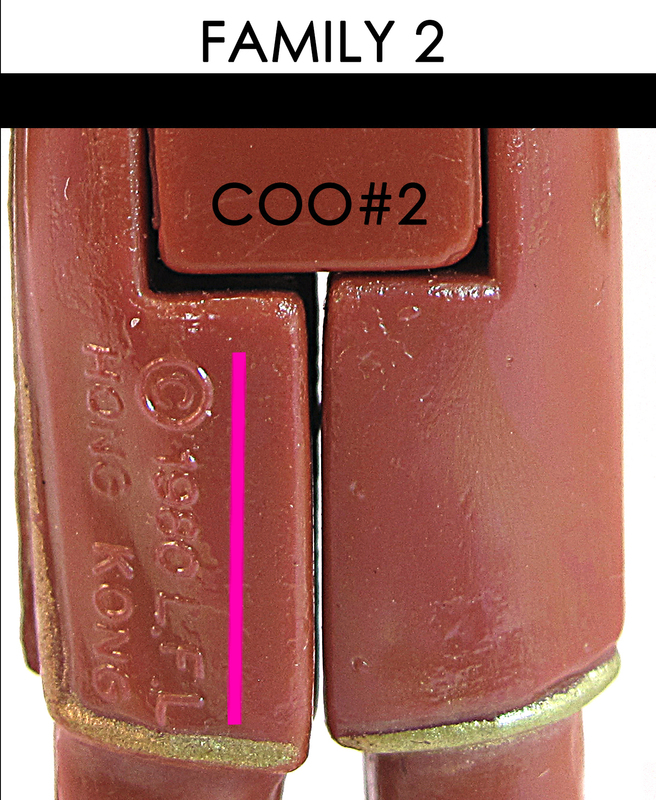 Here is a single image of what we are calling COO#2. It is part of Family #2. 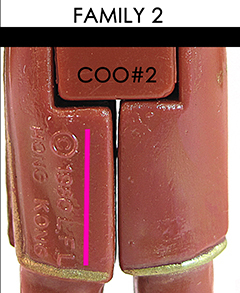 Its key identifying point is that it is a 2 Line, Straight, Made In Hong Kong COO Stamp. Of all the COO families, this one is the least commonly found. The Crew Necks are much easier to find while the turtle necks aren't as common. I am not saying this is rare! 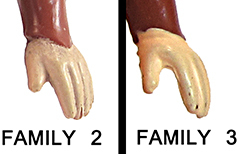 It is just not as common as the other families from what I have seen. If you look at her left hand, her thumb is closer to her hand than that of Family 3. Here you can see the difference of the hands to help you spot this COO Family in the wild whether inside bubble or in a For Sale listing. 2A: CREW NECK - AKA "Cross-Eyed"
This is one of the most common Crew Neck variants to be found which I refer to as the "Cross-Eyed" variant. It just makes me laugh 'cause it looks stupid'. Others refer to this as the "Fugly" Leia. 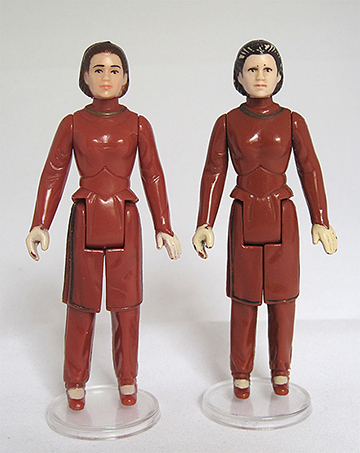 As far as Crew Necks go, this figure is pretty easy to track down and the "Cross-Eyed" version is one of the most common and easiest to spot when searching for her. 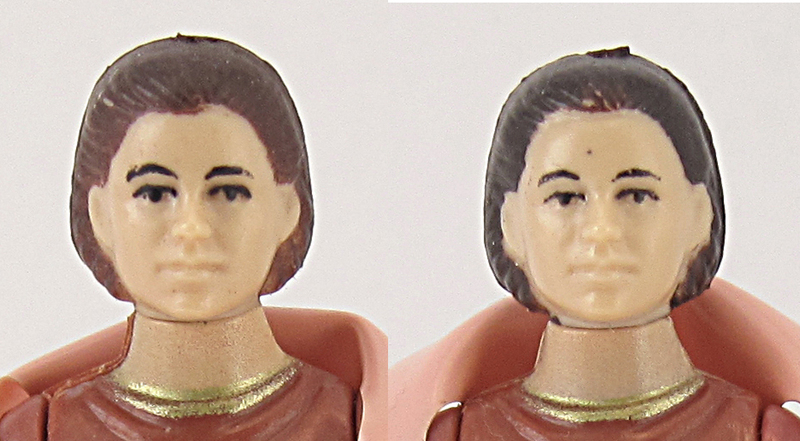 Here are two other variations of this figure with different eye paint masks and different hair colors. This figure is confirmed to have been packaged on Kenner ESB 31B, 32B, 41D & 45A backs. 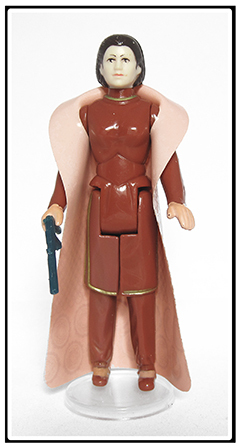 This figure can also be found in SW-A and ESB-C tape sealed baggies. 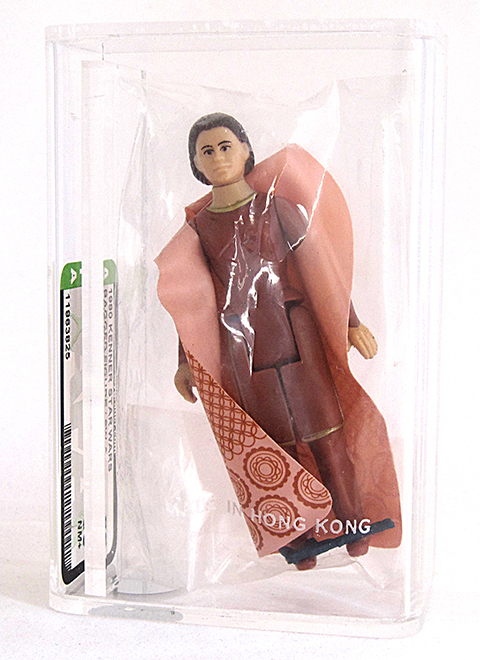 Please see the 'Packaging' section for more detailed information and possible sightings. 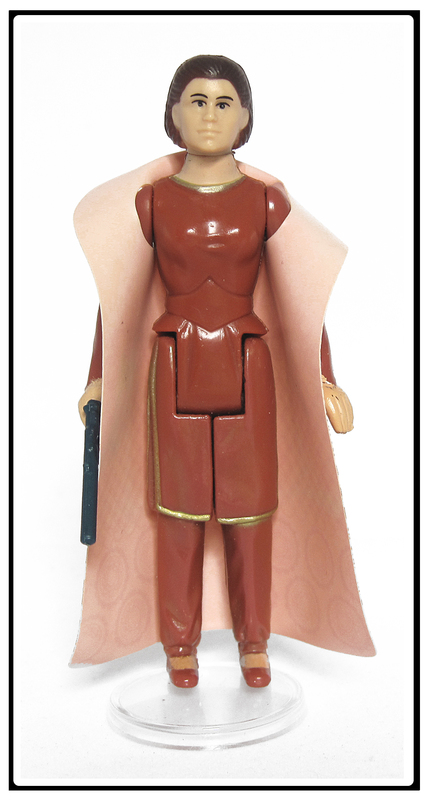 This figure can be found inside the SW-A baggies. 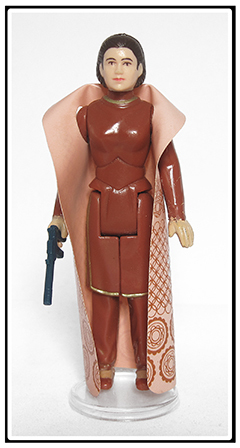 The origin of this baggie is from the very rare ESB Special Action Figure Display Stand. At least two of those stands were confirmed to be Toy Fair mockups. A little odd to see an ESB figure inside a SW-A baggie! 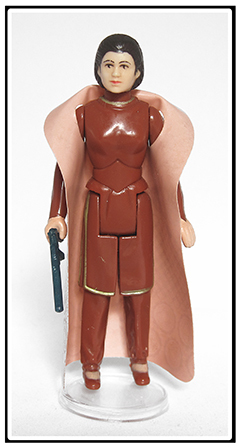 This figure can also be found inside the ESB-C baggies in the 1980 JC Penney - 10 Pack [928-0439] and the 1980 Sears - 9 Pack [49-59035]. 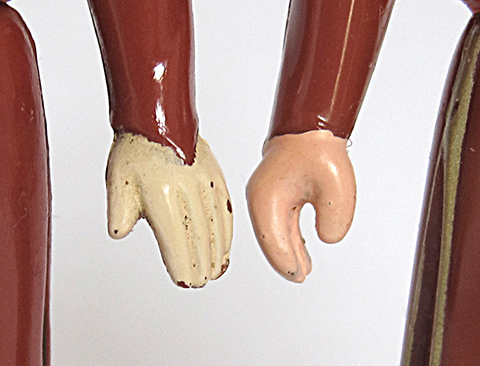 This figure is very similar to the figure below, the Pale Face, but this one has a slightly more pink tone to the face. Additionally, the hair is brown which didn't show up well in the photo. 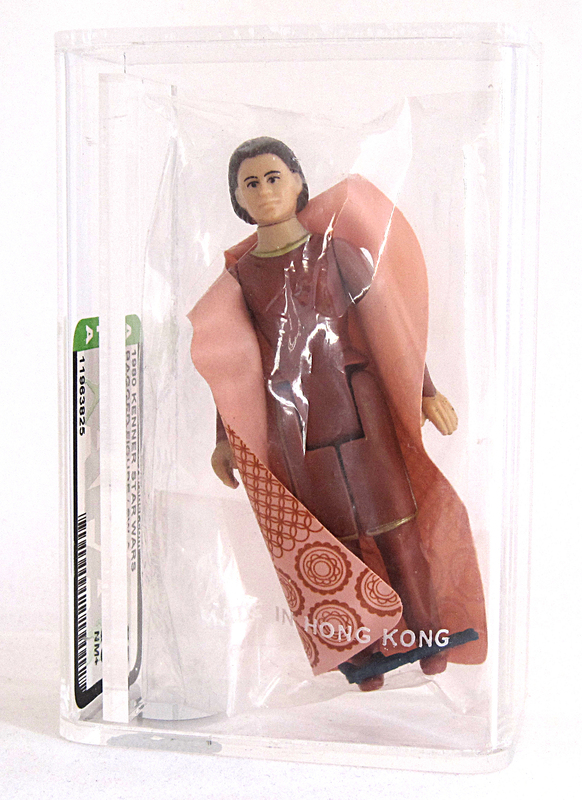 This figure also comes with a textured cape (Read about this cape here) which is unlike any other cape's material out there. Finding this variant is difficult due to photographing the face is hard enough and the textured cape needs to be photographed just right in order to see the texture. I have only stumbled across 3 loose ones over the course of a year and was fortunate enough that one of them had a cape in fantastic shape with no rips. I know the cape is rare and hard to find. Between the two I own and one other in a trusted friend's collection, all three with this cape came with the figure pictured. This figure is confirmed as the origin thanks to the 41B MOC example. 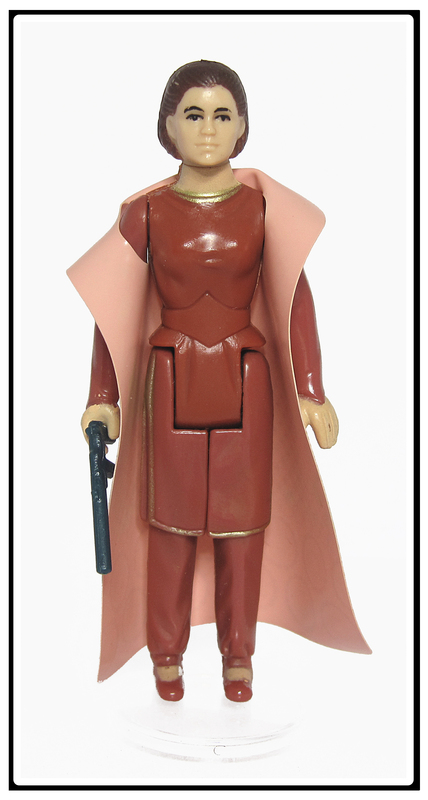 This figure can be found in Kenenr ESB 41B cards. 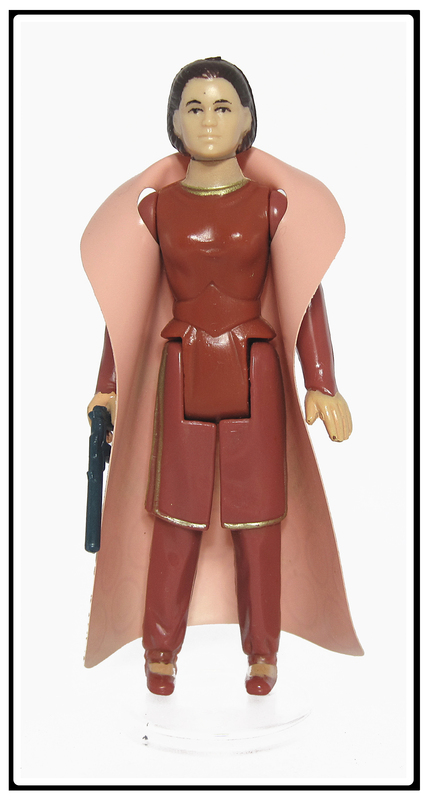 This figure is very similar to the one above, the Pink Pale face with textured cape, but the face here is a little paler and not as pink. It is a very subtle difference. Her hair is very dark brown to black. 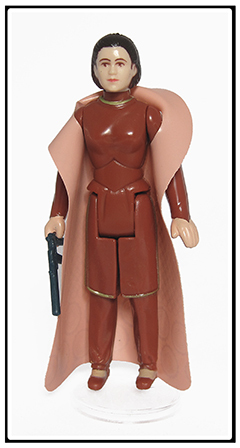 This figure is not rare, but is a little harder to find compared to other variants. 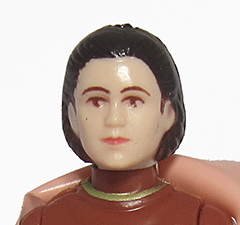 There is at least one minor variation of this figure in the eye color. It can be found with red/brown eyes as seen below. 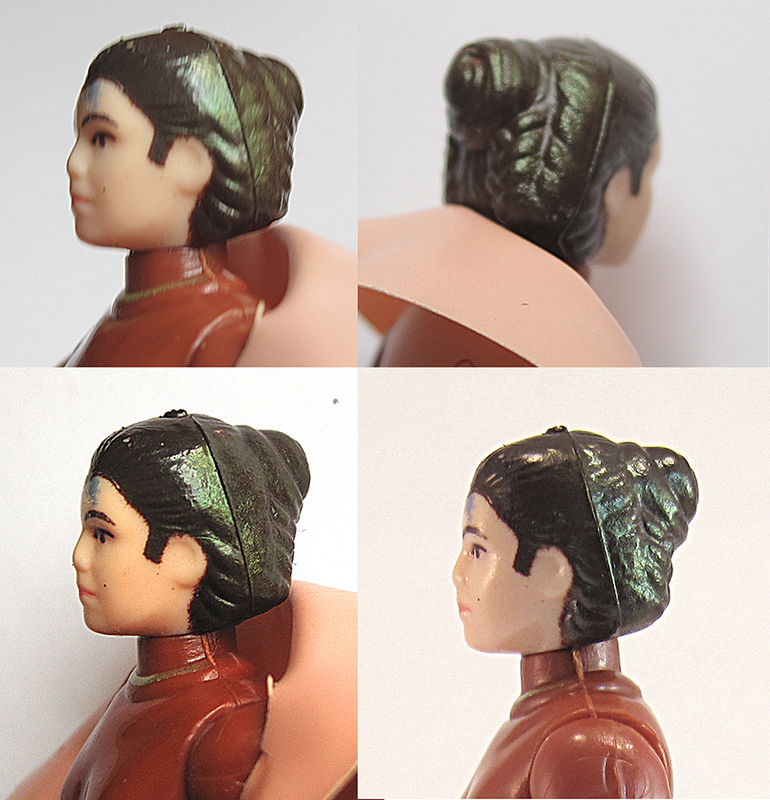 Here is a nifty factory error where either the mold was not properly filled (AKA short-shot) or experienced a lot of shrinkage due to cooling after she was removed from the mold. You can see this well from a side profile where her nose and chin do not protrude out as far as they should. She also has a transformant occurring in her hair making it appear to be a metallic green color. Unfortunately she has an ink stain on her forehead, but I like her all the same. 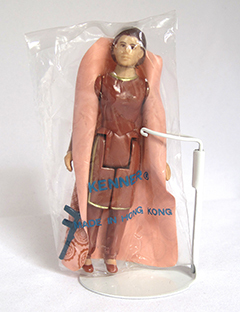 This figure is confirmed to have been packaged on Kenner ESB 41B and 45A backs. 2D: TURTLE NECK - AKA "Geisha"
This figure is not a true variant. It is either a Factory Error or a transformant of the Pale Face (2C) above. This figure is one of my favorites due to its weird appearance. It looks like a Geisha Doll or China Doll since her face is nearly as white as a Stormtrooper! 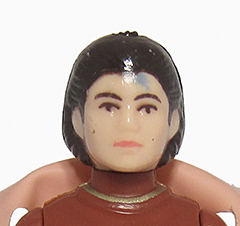 Add to that the way her eyebrows have lost just a little paint on the outside and you have a completely unique figure. I do not know what caused her face to be all white. It could be a transformant where all color pigments completely broke down leaving just white behind. Or it could be that the plastic used wasn't mixed properly. I really can't say for sure which occurred, but I think she is fantastic! Factory Error or a transformant caused this. I have never seen one even close to this. Some people make reference to a Geisha or China Doll or Ghost Face Leia, but this is NOT the figure they are referring to. 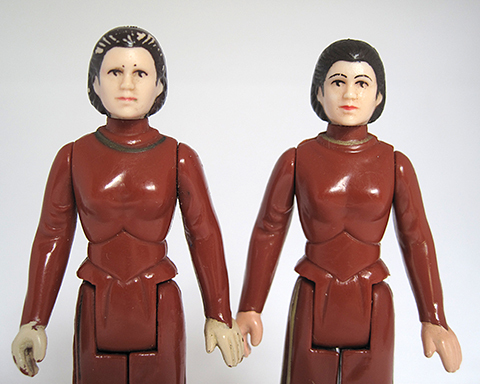 The figure most people refer to is the Palitoy Pale Face. 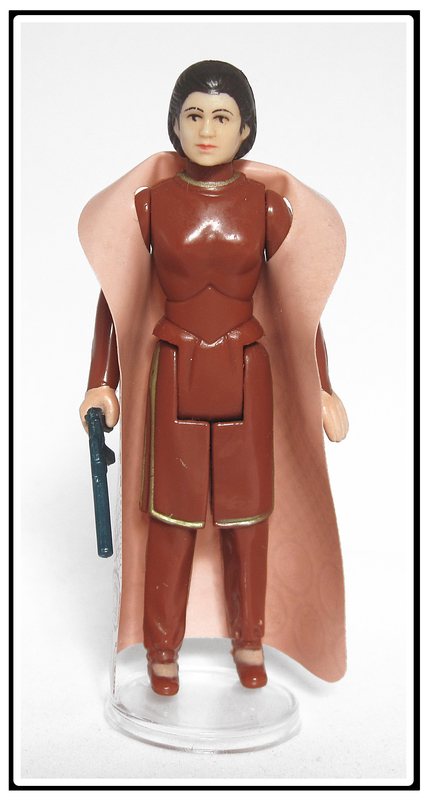 I have yet to find this figure in this condition carded. 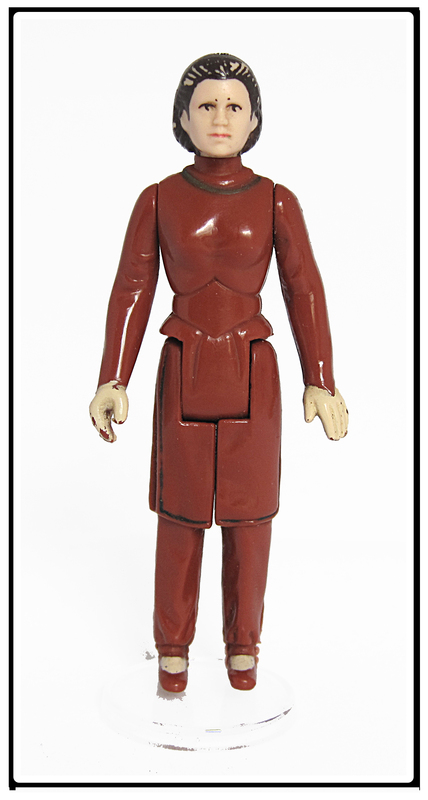 2E: TURTLE NECK - POCH"
This POCH figure is a relatively new find out there (mid to late 2012) confirmed as POCH by Kenneth B (I believe). A very limited amount of this figure have surfaced to date and even fewer complete with cape and blaster. She has the typical POCH pale/white hands and feet. She also have a very dark brown to black hair color. She also has a very poorly aligned, created necklace. If you look it is lower and larger than her collar. The cape I have seen (but do not own) appears to be a V3 cape, but the arm holes on the one I have seen are much larger than any other known cape. This could be a unique variant to the V3s. I hope to update this when I have more info on it. Since it is a very recent discovery, it is rare. Somehwere around 6 loose ones are confirmed but there are more hiding out there in the Spanish wild. She has been referred to as the Dark Haired POCH. However, I will simply refer to her as the Family #2 POCH since the other confirmed POCHs are all in the #1 Family. Here is a few comparison shots of her Kenner sister #2B or #2C (difficult to say which do the already very subtle differences between #2B & #2C). None have been confirmed to date.